The IP-XACT (standardized as IEEE 1685) specifications, delivered by Accellera, are enabling and standardizing effective IP reuse. Members of the consortium include more than 150 EDA providers, IP providers (ARM…) or system integrators . The IP-XACT specificationss are defining human-readable documentation for language-independent, interoperable IP module descriptions and tool interfaces using an XML databook format. 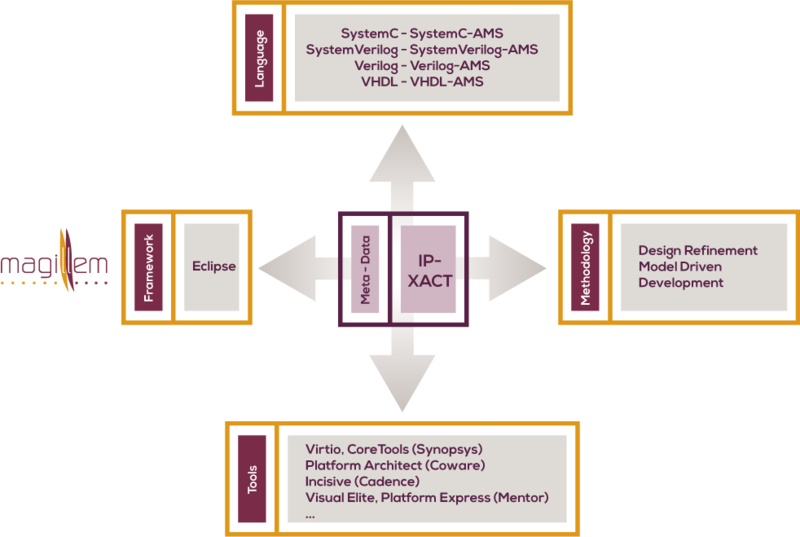 The IP-XACT description can document for example an IP interface, its registers and bit fields, pointers to the VHDL or SystemC files which define its RTL or TLM implementation, or its software views. ￭ We audit the existing industrial flows and propose a work plan to adapt them to the IP-XACT specifications. ￭ We test the IP deliverables against a benchmark using our: IP-XACT Packager and check IP integration properties onto a test system. Our offering includes software modules that guarantee early adopters with full ascending conformity of their IP files to any future upgrade of the IP-XACT specifications.